Analysis, commentary, practical advice and opinions. Links for further reflection. We respond to your comments. The Clarion Content has been trumpeting this idea about town for many weeks now. Perhaps then, dear readers, you have already heard about our Fashion Drive-by's? If not, here is the lowdown. The Clarion Content is partnering with local businesses, clothiers, boutiques, salons and others to help share their wares and tell their stories. We supply the models, the staging and coordination, as well as the fabulous photographer. Durham provides the setting. Our first Fashion Drive-by takes place in Durham's Lakewood neighborhood. A historic, still under-appreciated, rising star in our local firmament, Lakewood is home to a thriving microcosm of our Durham community. Our fashion partner for these photos, to whom we are very grateful, and we literally could not have done the shoot without, was Dolly's Vintage. They are located at #213 West Main Street, just down the block from Clarion Content fave, Toast. All ensembles are composed of borrowed pieces from this amazing store, where the best vintage finds are already all laid out for ones perusal, mixed amidst gifts and other magical tsotchkes. 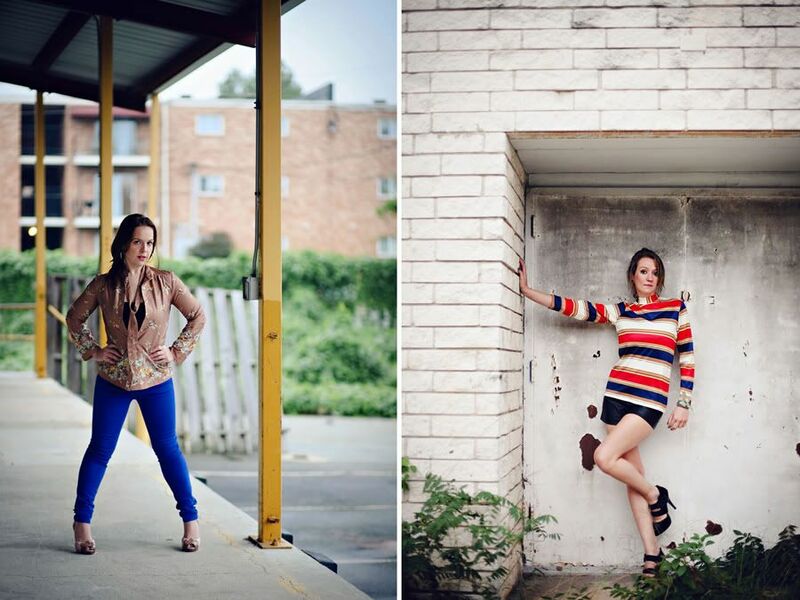 Cady Childs, the Clarion Content's Pop Culture columnist, functioned as a dual stylist and model for us, and will continue to do style work for our future Fashion Drive-bys. (Watts-Hillandale, you're up next!) 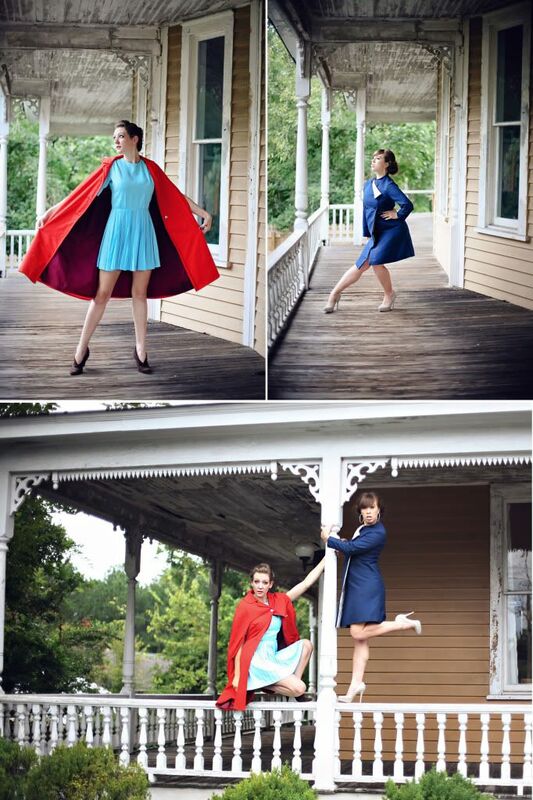 Jessi Blakely of Tamara Lackey Photography took all of the amazing photos. Cady Childs and Jessi Blakely collaborated on layout and design of this piece with the Clarion Content staff. 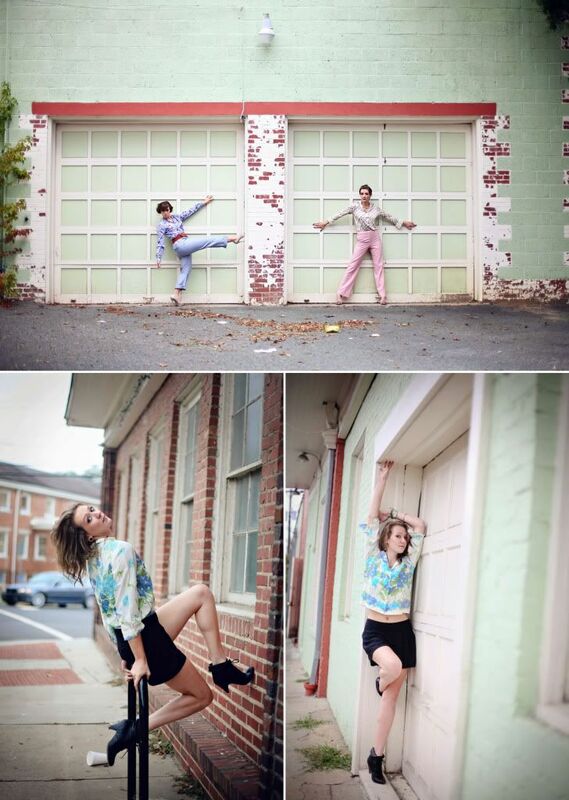 Special thanks to our outstanding, hard-working models, Cady Childs, Amy Blakely and Kelly Clark. And our thanks and gratitude to all of the local business owners and Lakewood residents who patiently let us photograph in and around their spaces and shops and many cases let us photograph themselves. Thank you to one and all who contributed. We started at the Renn-Vickers house at #1812 Chapel Hill Road. This house was built in the 1890's by railway conductor Captain Joseph Renn. It is a beautiful old Queen Anne. Today it is home to Capital Analytics. Click on the photos to see even more Fashion Drive-by shots from this location. Clothes from Dolly's Vintage, styling by Cady Childs, photos by Jessi Blakely of Tamara Lackey Photography, models Amy Blakely and Cady Childs. Did you know that there was once a rollercoaster where the Lakewood Shopping plaza is? Maybe you knew that there was a Woolworth's at one point, but a rollercoaster? It was the home of the Lakewood Amusement Park, opened in 1902. You could hop a street car from Five Points and roll over to Lakewood. Ahhh, Durham, you surprise us daily. These photos were taken at the far end of the Lakewood Shopping plaza in a building that one generation might remember as the Center Theater and another might remember as the Duke Surplus Store. Click on the photos to see even more Fashion Drive-by shots from this location. 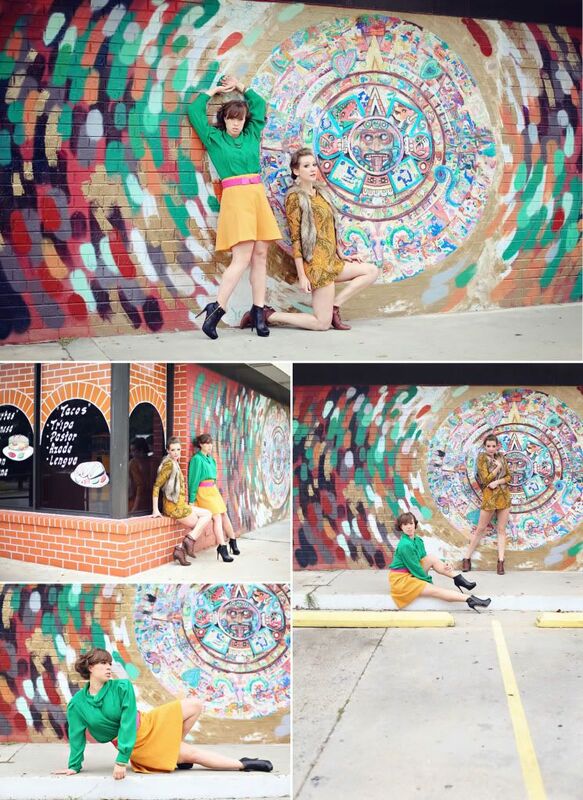 Clothes from Dolly's Vintage, styling by Cady Childs, photos by Jessi Blakely of Tamara Lackey Photography, models Kelly Clark and Cady Childs. Roll's Florist was established by Fred Roll in 1937 on the corner of Lakewood Avenue and Chapel Hill Road after he served as the resident florist at the home of Brodie Duke. The greenhouse flourished for many years closing in the 1970's. The property is still in the family and the former retail store, right on the corner, #2001, is a highly recognizable neighborhood landmark, though no longer a functioning shop. Once again click through to Endangered Durham to see some amazing pictures and read even more about the history of the site. The far right shot in this series of photos is the mural painted on the side of the Institute for Southern Studies. Click on the photos to see even more Fashion Drive-by shots from this location. The Azteca Grill, on the corner opposite Roll's Florist, is a family business that was established by Magaly Arguelles-Espriella and her husband, Ruben Godinez. They chose the name Azteca because they wanted to signal to Durham's burgeoning Mexican community, and us gringos, that unlike many of our terrific, local Mexican establishments, they do not specialize in the cuisine of one particular region of Mexico. They started their business out of a food truck back in 2002, before Durham's food trucks were so eponymous and hip. The restaurant was a long-time family dream. They know this Durham community and our health-conscious ways, everything is made in-house and fresh, no artificial preservatives are used. The Azteca is famous for its super tender Carne Deshebrada, a special family recipe for slow-cooked, highly seasoned, shredded beef. Azteca Grill also has free wifi. Click on the photos to see even more Fashion Drive-by shots from this location. La Favorita de Oaxaca is a panadería (bakery) in the highly recognizable former Davis Bakery building. Endangered Durham has some amazing shots of the building back in the day. They include one of the mural that is still faintly visible on the north side. The original bakery facility dates back to the 1920's. Some of the ovens that were in use during World War II are still inside the shop (and functioning). Unlike Azteca, La Favorita is a Mexican panderia that does indeed specialize in a regional type of baked goods, Oaxacan. Owners Estella and Erasto Bernabe bought the shop six years ago after visiting her mother in Durham from California. Erasto and his family had been bakers in Oaxaca for many generations. Estella is El Salvadorean. Their store reflects their wider interests, selling a variety of goods, from bottled water to pinatas, candy to votive candles and everything in between. The baked goods alone are worth the trip. Not only are they delicious, but for those used to paying the rate in some of Durham's tonier establishments, the prices will knock your socks off, they, too, appear to be from the World War II era. You will quite literally not believe how far $3.00 will go. Click here for a gallery for Lakewood Proprietors and residents from the Clarion Content's Flicker. Thanks again to all our team; unbelievable work by Cady Childs, Jessi Blakely, Kelly Clark, Amy Blakely, and thanks again to all of our partners; Dolly's Vintage, Azteca Grill, La Favorita de Oaxaca, the Ensminger family, and Capital Analytics. Thanks for making my neighborhood even more beautiful! Cheers! Thanks so much for the lovely compliments. We are big fans of Lakewood. Clarification--- In the original version of this post we mistakenly said that the former Rolls Florist was no longer a working store. That is incorrect. Although it is no longer a florist it is Natural Environmental Ecological Managemen or NEEM. It is a registered 11.2 acre urban farm. Read more here.